I'm lucky to call myself an independent filmmaker. For the past two years I've had the opportunity to produce, write and direct films that I care about. I have been working in the film and television industry for over 25 years and I have produced award-winning documentaries and have developed and produced ideas for television in the form of reality sizzle reels. In an earlier incarnation, I worked on many features and television shows as a sound editor. I sometimes work as a cameraman and also as an editor. I am currently finalizing my feature documentary Land Of Little Rivers, which I produced and directed. My next adventure will be bringing one of the feature screenplays, which I have been writing over the past 10 years, to the silver screen. For 4 years I worked as a video producer at The Omega Institute. I produced hundreds of short videos for marketing and promotional purposes. I also produced longer content multi-cam conferences and panel discussions. Some were live streamed and others were turned into online learning programs. My first union job was on Places in the Heart where I bought lunch for all the sound editors, purchased snacks and cleaned miles of sound fill for four months. My boss was Richard Cirincioni, the man responsible for the helicopter sounds in Apocolypse Now. I tossed a medicine ball to Dustin Hoffman during the days we spent on the mixing stage of Death of a Salesman when he needed exercise. He took me and the other team of editors as his guests to Toronto to attend the screening of the film at the Toronto Film Festival. One day on the street as I was coming to work, Dustin introduced me to Warren Beatty, saying, "this kid's film just got nominated for an Oscar!" I didn't know what to say. I drove Arthur Miller home in my rusty old 1964 Nova station wagon one evening. He didn't mind the ripped bench seat covered with a sheet! On a trip to film author James Ellroy's mother's grave in LaCross Wisconsin, I sat next to the author, devouring his first novel Killer on the Road, during the production of the film I was helping produce for the BBC, James Ellroy's Feast of Death. Norman Mailer brought me to The Actor's Studio in NYC when I worked for him on Tough Guys Don't Dance. I moved to Los Angeles shortly after and was never able to take advantage of his wonderful gift. I once had to check the sound on Batman & Robin prints in a giant theater on the Warner Brothers lot for an entire week. I almost went mad having to watch that movie over and over and over again. I would walk around the theater just to keep from falling asleep! The amazing director, Errol Morris, was a friend of mine when I lived in NYC and asked me to help him make some last minute changes on his film, The Thin Blue Line, after his regular editor went on to another job. At the Telluride Film Festival, I met Daniel Day Lewis when he premiered his film, My Left Foot. He was very nice and later that day I had lunch at a table with my friend, producer Tom Luddy, the founder of the festival, and Roger Ebert, the Chicago film critic. Roger picked up the tab! 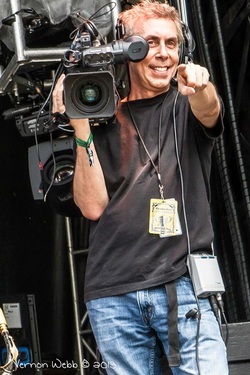 Aaron Weisblatt has cut a wide swath in the film and television industry, working as an editor, sound editor, cameraman, producer, director and writer. Currently finalizing LAND OF LITTLE RIVERS, a feature documentary on fly fishing, he is busy developing feature film stories from his screenplays. His first documentary, SAM, was nominated for an Academy Award. It aired on The National Geographic Explorer Series and the UK's Channel Four. He co-produced the critically acclaimed BBC documentary FEAST OF DEATH, about the best-selling author, James Ellroy and later produced and directed an award-winning feature documentary, BETWEEN TWO WORLDS, which won numerous awards on the film festival circuit. He was a picture editor on The History Channel's 10-part award-winning series, WWII IN HD and a cameraman on the first season of A&E's TATTOO HIGHWAY and on an episode of INTERVENTION. He has produced non-scripted reality/docu-soaps, HELLER ON WHEELS, WOODSTOCK LOGGERS and co-produced a series pilot called AMERICAN TURBO with the producer of ORANGE COUNTY CHOPPERS. Additionally, Aaron produced concert footage of some of the last historic concerts at Levon Helm’s MIDNIGHT RAMBLE. He has also worked on the documentaries Evocateur, Disturbing the Universe and Earth Days. Aaron began his career in New York City working as a P.A. on commercials, television series and industrials while attending New York University. Upon graduating, he became an apprentice picture editor and later became an assistant picture editor and a sound editor after moving to Los Angeles where he worked on many features and television shows. He has had the opportunity to work with many talented producers, directors and actors such as Dustin Hoffman, Volker Schlondorff, Sam Rockwell, RobbieBenson, The Hughes Brothers, Joel Schumacher, Peter MacGregor-Scott, and documentary filmmakers Errol Morris, Nick Broomfield, Vikram Jayanti and Joan Churchill.